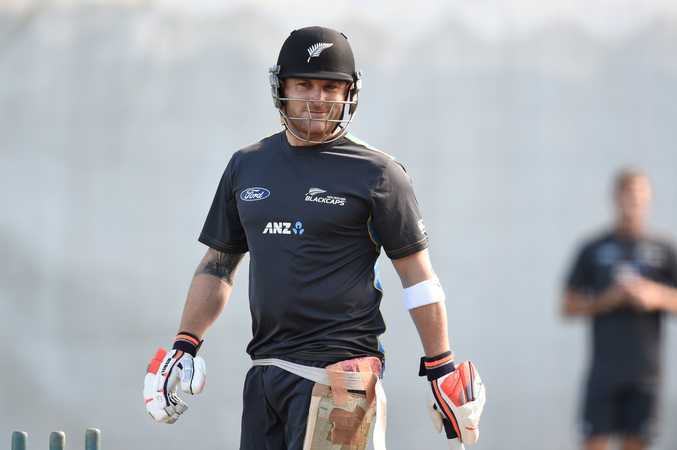 Brendon McCullum in the nets yesterday. Photo AAP Image. Across the ditch, the second Test in New Zealand is awash. Well not literally, and fingers crossed I haven't offended the cricketing gods who might elect to send a bucket load of rain in the direction of Christchurch tomorrow. But there is a lot of emotion and expectation swirling around the deciding match, one that could see the Aussies return to the world No.1 ranking if they can draw or win. It is also Brendon McCullum's 101st and final Test for New Zealand, in a venue and city that has made great strides to recover from that dreadful earthquake in 2011. While I always support Australia whenever a team runs out to represent us, I have a sneaking hope that 'Baz' can go out on a high. Maybe he will get a ton and we will still win, with Joe Burns and Usman Khawaja getting some runs too. The Brisbane Heat players are eagerly anticipating having Brendon around in person later this year for the Big Bash League, when he will captain the team. I didn't play for the Heat in the first year of the competition, opting to join the Melbourne Renegades, and so missed out on being around the first time he was with us. Even though he wasn't able to take up the first year of his contract with the Heat in BBL|05, his influence was definitely felt. As captain, Chris Lynn used to remind himself during games, "WWBD" - What Would Baz Do? I am sure some of Lynny's batting success came from taking on the game like Brendon has been renowned for. I think he will be a great addition to our side, and the competition, and I'll look forward to talking cricket, fishing, racehorses ... and anything else he is up for! It's been exciting progress on another front as well with the old and young Bulls combining for an important win this week in the pink ball day/night Sheffield Shield game against Tasmania at the Gabba. On the experienced side of things, James Hopes and Chris Hartley were exceptional, with Harts becoming the first wicket-keeper to take 500 catches in the Shield, while Sam Heazlett, Matt Renshaw, Jack Wildermuth and Mitch Swepson all did their bit for the up and comers. The win lifted Queensland into second spot behind Victoria with three games to go, but with two of those against WA and one against the Bushrangers, no one is getting ahead of themselves just yet.